Since the 1950’s, the regions connected by the Mekong River uphold a perception of people hardened by war, an “unstable environment” that most Baby Boomer’s would shudder at the thought of visiting. These ideas may have held true throughout the 60’s and 70’s, but these concepts could not be more false in the 21st century. During the Vietnam War the most information westerners received about the Mekong River: troops fighting with the Viet Cong, supply routes, or a daring story of how Martin Sheen sailed up the river to find Colonel Kurtz. While the Vietnam War ended 42 years ago many people still hold the same perceptions of the region, and often think twice about visiting. However, weeks before leaving to South East Asia, my friends Nick, Jeremy, Kyle, Mike and I were on Skype chatting about our upcoming trip, throwing around ideas, and arguing over routes on the map. 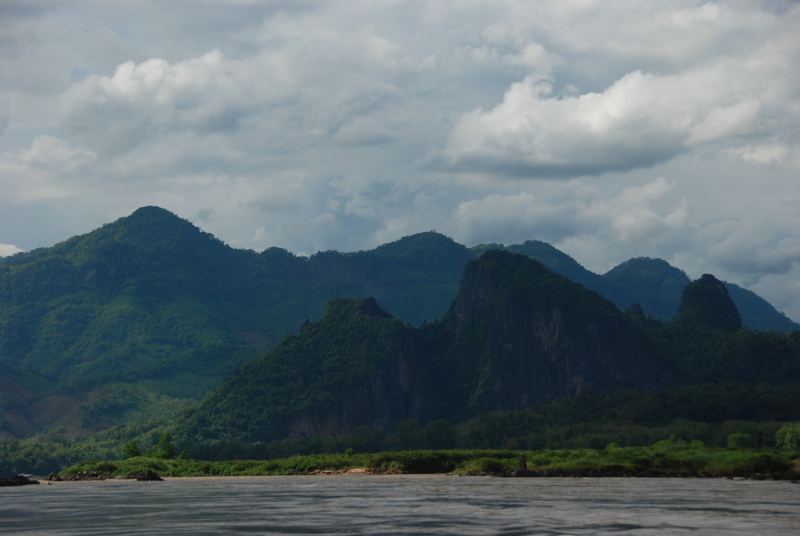 When entering Laos and to a further extent Laung Prabang (a large port city in Northern Laos) came into question. The overland route into the country included a 17-hour bus ride through the winding countryside, and the airfare was wildly overpriced. 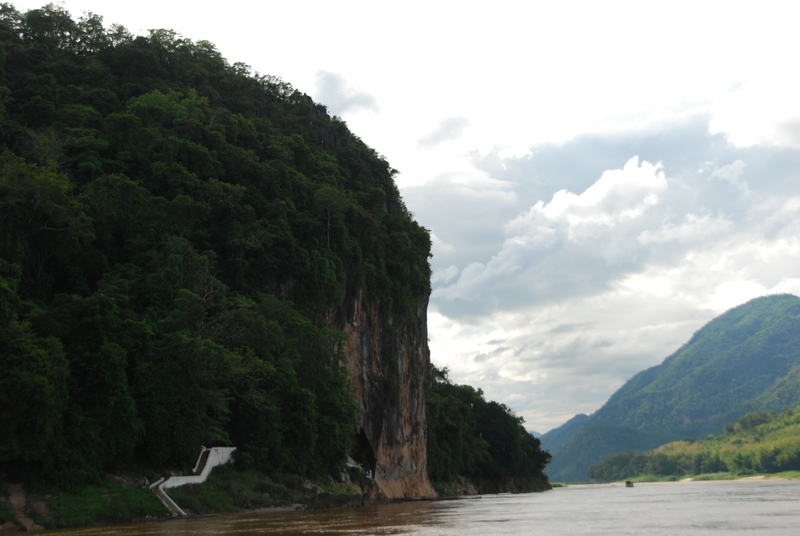 Soon the Mekong River came into topic, “We should just get on one of these long boats” Nick commented. “Looks like it’s a two or three day river journey down the Mekong, am I reading that right?” said Mike begrudgingly. Thoughts came flooding into my head about how unsafe, life threatening, and boring that a boat ride could be. Though one after another we all came to an agreement, “Hey, why not it could be an adventure.” Later that night we’d plan a trip down one of South East Asia’s most infamous waterways. The boat, though more of a wooden bus that glided down the river, was an old and creaky ship fairly similar to a European canal boat. The seats were repurposed minivan bench seats still equipped with unusable seatbelt slots. The stains and rips in the fabric eerily reminiscent of a friend’s mom’s van from high school. Towards the back, the engine laid fully exposed. Belts whirled and pistons pumped, all for everyone to hear making it extremely tough to get any shuteye. Upon further inspection towards tail of the boat a smiling woman set up a makeshift convenient store. She sold anything from toilet paper, knock off brands of Pringles, store bought Oreos, to a couple cans of the local lager, Beer Lao. The air was hot and heavy, thick enough to cut with a knife, and without the boat moving there was no comforting breeze. In a flash travelers came spilling out of nowhere, people from all over the globe creating a dysfunctional and half-drunk United Nations. The motors kicked on and with a swift push of the dockhand’s foot the boat set off cruising down the river in no time. The boat was filled with mostly weary travelers looking for a more scenic route, but there were some locals on board as well. It became an area of excitement and debauchery, as an old Chinese woman stole and then wore a Scotsman’s hat; a roar of laughter came from travelers aboard and the Scotsman blushed. A bottle of a cheap imitation of Red Stag was passed around for anyone to take a swig of, as the mood quickly turned jovial. In the back of the boat, smoke came billowing out like a chimney fire, folks smoking a mix between the locally sold banana leaf cigars, and hand rolled cigarettes. The perfect quiet spot was in the middle section of the boat, between the rowdy seating area and the slowly mellowing smoking area, right next to the engine. Strangely enough, the drone of the engine could carry almost anyone to a meditative state. This area was majestic in every sense. Hills sprawling endlessly colored the landscape emerald green, filling the canvas of this area and creating vast jungles untouched by the horror of previous wars. Silted water rushed endlessly around the edge of the boat, forming a dirty brown color contrasting to the regular blues and greens one would associate with water, swirling and crashing up against every rock formation that came in its way. Mountains stuck through the mist gave the impression the clouds themselves were being cut in twain by cliff faces. Chiseled into one of these faces, a staircase leading up to a temple shrine to Buddha. Locals and travelers ferried across the water to pay their respects, and gaze in awe of the dedication required to make such a shrine. These incredible sights could make traveler feel that they had floated down a river, to only arrive at the mythical lost city of Shangri-La. Thinking of all those warnings of how dangerous this area could be, and how false they were, there is not a more peaceful place on this entire planet. As the day rolled on into the evening the sun was finally setting swirling the sky a mixture of coral and purple as the boat reached its first stop. Everyone excitedly exited the boat into Pakbeng, a village strictly based around the tourism of the stopping over for the night. Guesthouses lined the streets as their owners stood outside offering tours of their rooms and a “fair” price to rent. The restaurants served a wide range of food to accompany any tourist: pad thai, curries, or burgers and fries. While the only nightlife in the town consisted of a dimly lit dive called, “Happy Bar” which every traveler on the boat flocked to and enjoyed until the wee hours of the morning. The cry of the rooster meant it was the crack of dawn, and when everyone boarded began its departure. The vessel had a sort of hush about it, everyone who passed around the local knockoff hooch and spending late hours of the night at the “Happy Bar,” now slumped silently holding their throbbing heads as hangovers set in. Though despite their ailment some travelers could tolerate it more than others, and a soft chatter began again throughout the boat. In the distance, children sang and danced in the morning sun as the boat motored past. The commerce on the water was booming, fishermen and their sons casting out long nets, going about their daily lives to provide food. 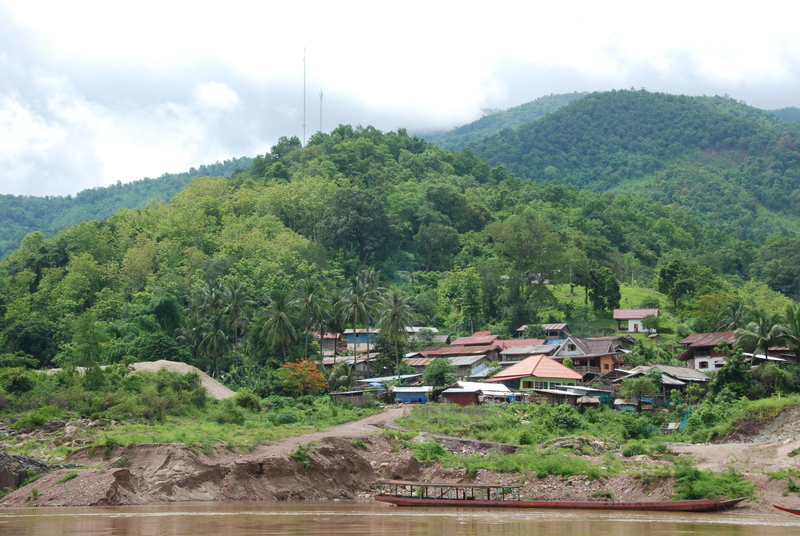 Occasionally a long boat or a motorboat passed bringing just locals back up the river towards Thailand. They smiled and waved as if to greet us into their country, a sight that is not easily forgotten. People genuinely happy, not living in a preconceived notion of their violent past, but rather moving forward. 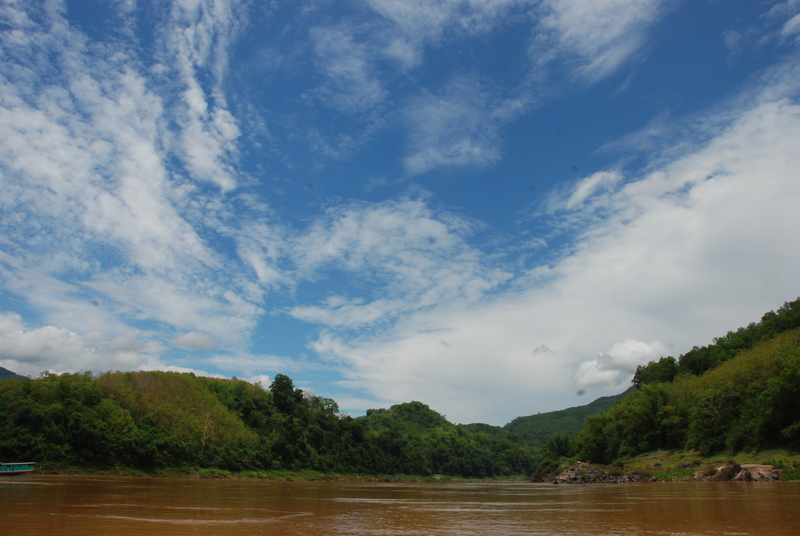 The sights and the smiling faces of locals instantly proved wrong any perception of the Mekong River. This area was now bursting with happiness and beauty. Hours quickly melted into minutes, and conversations with fellow travelers flowed from travel sickness to future plans of travel into Vietnam, eventually the boat came into docks of Luang Prabang. Though the traveling was monotonous and at times boring, being confined in one spot for eight hours a day, but I would never trade it for a cushy bus or plane ride. 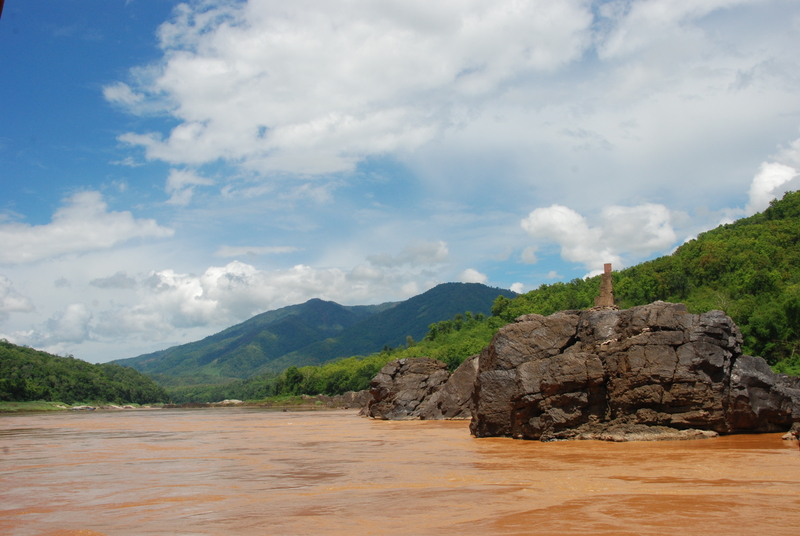 True this area of the Mekong River was muddled in conflicts for much of its recent past. However, the riverboat journey made clear that these people have put the past behind them, not any easy feat by any means. Which begs the question, “Why can’t the western world do the same?” A task many American’s specifically would think impossible, but land with such sprawling majesty and rich culture should not be stereotyped for a part their of history. Rather it should be remembered for the smiling faces giving a welcoming wave of the local people on the boats passing by.